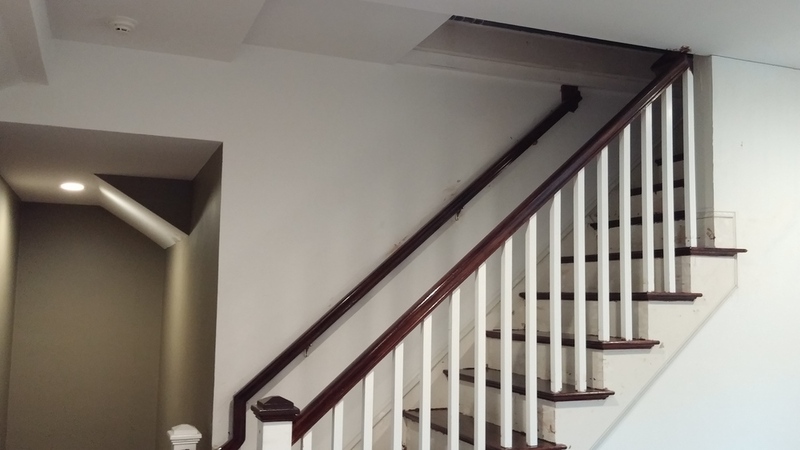 Recently did a big job, which included painting many ceilings that had a lot of water damage, cracks and nail pops that were the result of some bad craftsmanship by the the contractors that built the home a little over two years ago. The most enjoyable part of the job was painting the unfinished exercise room. I decided to go with Benjamin Moore Aura eggshell sheen on this job. I have not used this paint a lot, but have heard great things about it. What great paint. Deep, rich colors. Easy to cut with, and rolls on even better. 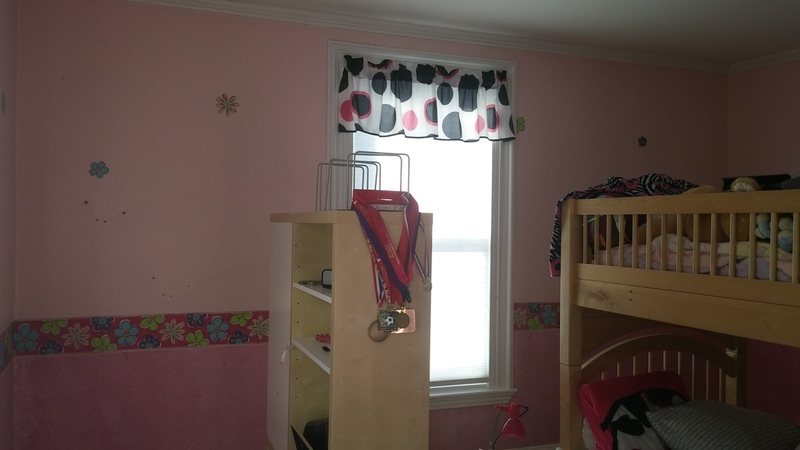 The color on the walls is Refined, the ceiling was painted with Benjamin Moore Waterborne ceiling paint, and the trim was done with Benjamin Moore Advance in semi-gloss. 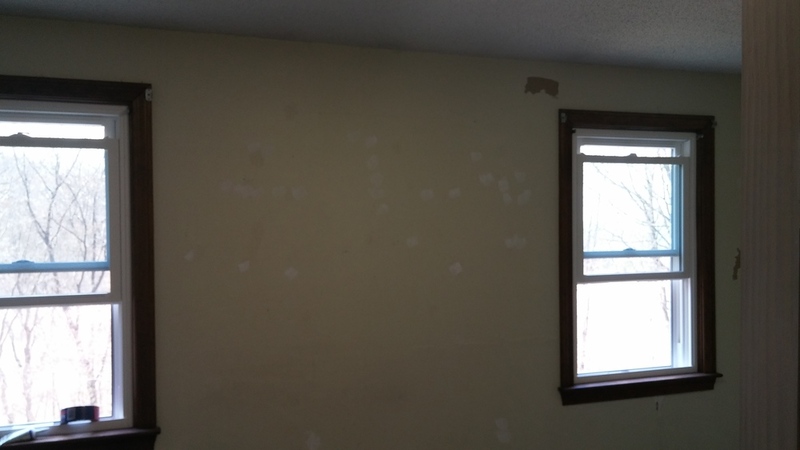 Some before, during, and after pictures from a recent wallpaper removal that I did in Rockport. 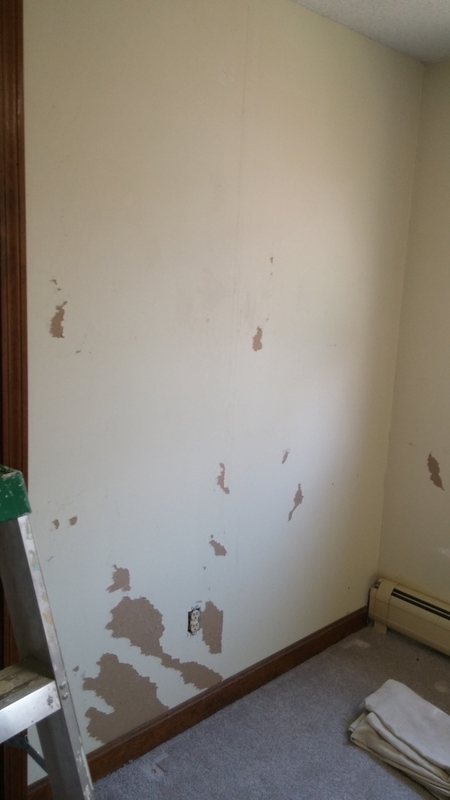 The wallpaper came off easy--did not have to use any Dif, but as you can see from the pictures some of the gypsum board did get damaged, which required a skim coat. I forgot to take a picture of the areas skim coated. I only painted the walls and the ceiling in this room. A little Zinsser Diff, a lot of elbow grease, a couple coats of Benjamin Moore Seagrove in Regal Select matte, and the room has a whole new look. Recently painted a foyer, stairwell, and hallway. The walls were done in Jamaican Aqua in Regal Select eggshell, and the front door and side lite are painted in White Christmas Advance satin, which is also by Benjamin Moore. On February 17th, 2015 an image of a dress went viral on the internet. I initially saw it on the local morning news (one of the reason that I really only watch the local news for five minutes-long enough to see the forecast). It went viral because a consensus could not be had on the colors of the dress. As I often tell my costumers--get samples of the color(s) you want to paint and paint a few spots in the room to see how the light in the room throughout the day will influence the color. This is what is going on with the whole dress color disagreement. Wired Magazine posted an article titled The Science of Why No One Agrees on the Color of This Dress. It is a short read and I recommend it for anyone thinking about painting. A lot of Home Owners are deciding to have their kitchen cabinets refinished instead of replaced. This is a great money saving option if you cabinets are in good shape. There are several things that you should consider if you plan on having your cabinets painted. If you have very nice cabinets that have never been painted you will most likely want to find a painter that sprays cabinets. I, unfortunately do not spray. Spraying allows for a very smooth (no brush strokes visible finish). If you have older or lower quality cabinets, that you are just looking to spruce up, than you might not mind seeing some brush strokes on the cabinets, then you can consider painters that do not spray. 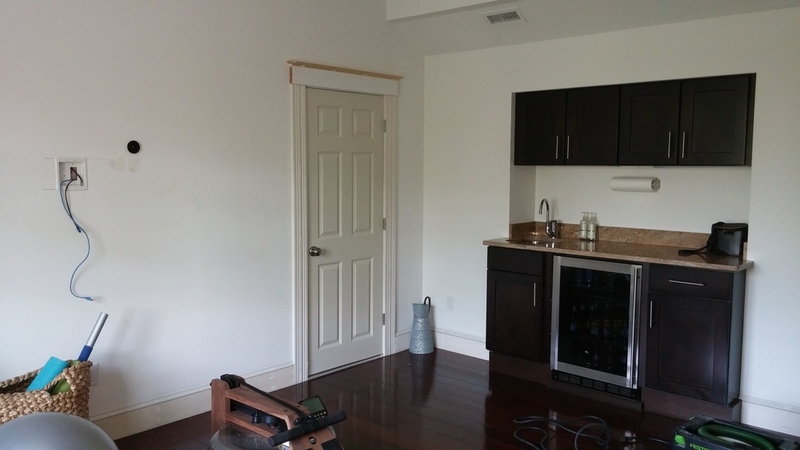 The images of the cabinets in this post were such cabinets were brushed. However, if you want a near perfect finish (sprayed) and your cabinets were previously painted before, a near flawless finish might be tough (expensive) to achieve. In order to get a smooth finish on the top coat, the coats underneath much also be smooth. If your cabinets were brushed (or even worse--rolled) then it will take a lot of prep (time) to get a smooth finish before the cabinets are painted. Some basic things that you should consider before you decide to have you cabinets painted. If the doors will be painted on site, a large area will have to be used to paint the cabinet doors. The pictures in this post are of a recent cabinet job that I did. The cabinets were brushed. I wish that I had taken some better before pictures, and more after pictures of the interior of the cabinets. If you notice that the window sashes are dirty--it was extremely cold, and I was unable to paint them. This will be remedied in the Spring. The one image that has a plastic on the door and window was taken when I was prepping to do some lead work on the door frames and baseboards. If you are like most Americans you want to get the job done as quickly as possible. But, if you recently had a new deck built or trim installed using Pressure Treated Wood you need to curtail your urge to get the job done. First thing that you should know is that a lot of pressure treated wood is Southern Yellow Pine, which is not the best at holding paint, and pressure treated wood really is not meant to be painted. Next, if you do decide to paint or stain, you have to wait until the wood is dry. Pressure treated wood is wet 99% of the time when it is installed. And, the best way that I have read to explain the issue with painting or staining wet wood used a sponge analogy. So here we go. Think of the wood as a sponge. When you paint the first layer of paint, which is hopefully a primer, this paint is absorbed by the wood. This is much more true when using a penetrating stain. If the wood is wet it cannot absorb the paint. Instead it dries on top of the wood with very little, if any adhesion. Thus, in a very short time frame you will have paint failure. Your best bet is to wait six months. Or, if you own a moisture meter, the moisture level should be 14% or less. If you do decide to use a paint or a solid stain, than it is best to use a long drying oil primer. Oil primers penetrate into the wood more than acrylic paints, and the longer that the primer has to dry the more it will penetrate. Also, oil primers will block tannins from bleeding through better than acrylic primers. Azek plastic is becoming a very popular alternative to wood on many home improvement jobs, repair jobs, and new construction. The reason--it lasts longer than wood. Since it is plastic it does absorb water and thus does not rot, which is often a major problem with wood. This is especially true with north facing walls of houses. Almost every time that I see wood on a home that should be replaced before I paint I recommend to the Home Owner that they use Azek. However, If you choose to have your contractor use it on your next project, and you intend to paint it, then you must consider that any paint that goes out it must be 100% acrylic and have a Light Reflective Value (LRV) of 55 or above. This means that most dark colors are out. Usually LRV can be found on paint fans. I am assuming that the reason for this is that if the paint absorbs too much light it will lead to the paint heating up, which will then lead to paint failure. Azec, which is white, does not have to be painted. However, it is the only way to cover the nail holes and make the edges of the Azek that has been cut look nice. So, if the trim on your home is painted black or brown and you decide to use Azek for a repair of rotten wood, you will have to change the color of the rest of the trim to make it match the new lighter color that will be needed to paint the Azek. Did some work for a women who had some cracks in her walls and was tired of looking at them. The worst areas were in the ceiling. Once I got up on the ladder and began the worked I quickly learned what the problem was. There was no sheetrock in the corners on the ceiling. The person that had done the work put the joint compound tape on nothing--air. Fixing this issue is somewhat time consuming. The holes first had to be filled with Durabound, and then the seams had to be retaped. Not all of the cracks, and there were a lot of them were so severe that they required mud. The less severe one's were opened up a bit with a utility knife and then filled with Crack Shot. Once everything was cleaned up and repaired two coats of Benjamin Moore Regal Select Gossamer Blue, and one coat of Benjamin Moore Waterborne ceiling paint. When the HO told me she likes color, I told her that I do too. It took some time to figure out what company made this color, which is called Arizona, but I like the results. BTW Arizona is a Behr color, but we were able to get it made in California Unite paint. California has the formula to make it in its paints. The pictures do not really represent the true color, which look a lot more yellow than the deep orange that they were. There are also some photos of the ceiling when had a lot of dis-colorization due to the fireplace which they enjoy in the colder months. Without getting into any details, I don't believe in slamming someone on-line, I recently had a bad encounter with a home owner, which was essentially the result of the home owner not taking my advice, and then blaming me for the results. Again, without any specifics, I was hired to paint some new wood. The wood had tannins, those are the stains you see come through paint (think knots), and I told him that one coat of primer and one coat of stain would most likely not work. He also had me stain, despite me telling him that I did not think it was a good idea, a material that should have been painted. I am trying to be a vague. Well, when he looked at it on the second day, the tannins in the wood were showing through, and obviously needed at least one more top coat, and the paint that was on the other material looked terrible. In retrospect I should have never taken the job. The home owner had a preconceived idea of how the job should be done and how long it was going to take. When it did not meet his expectations, despite warnings from me, he blamed me. There was another instance in which this home owner did not trust my experience and knowledge. The moral of the story--trust the person that you have hired to paint your house. They are professional (hopefully) and know what they are talking about. 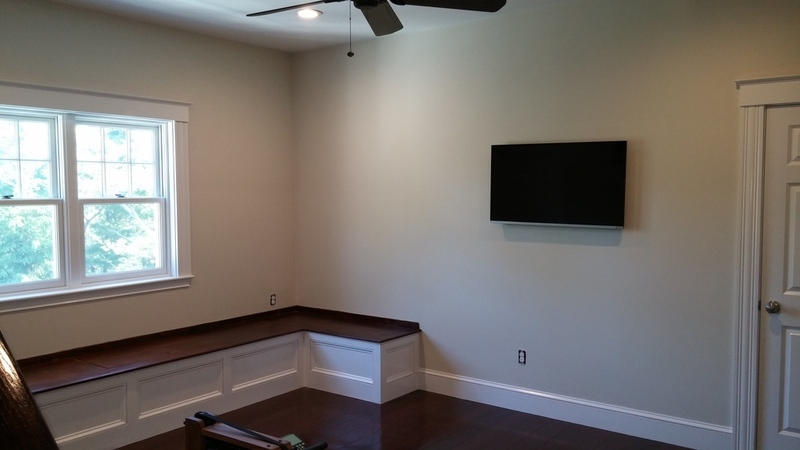 Many home owners, when hiring a painter, assume that the price that it will cost to paint a room or a house is determined by the size of the area to be painted. To some extent this is true. A 60ft x 20ft living room will almost always cost more than a 12ft x 12ft room. However, very often this simple rule of thumb does not apply. Following are two examples that demonstrate my point. I recently painted a small bathroom with unpainted tongue and groove. It took three days to complete. This is longer than it often takes to complete a standard 12 x 12 room. Why? One reason is that small spaces are hard to move around in, and thus harder to paint than large, wide open spaces. Also, bathrooms have a many items to cut around such as toilets, sinks, and pipes, that are not found in rooms such as bedrooms. When painting outside, it is also not always clear-cut formula size equals price. Many factors are considered. One of the biggest issues is whether or not there is vegetation (trees, shrubs, plants) to work around. Setting up ladders becomes much more difficult and time consuming when when a painter has to work around vegetation. I recently did a job painting windows on a fairly small building that had a lot of plants and trees to work around. 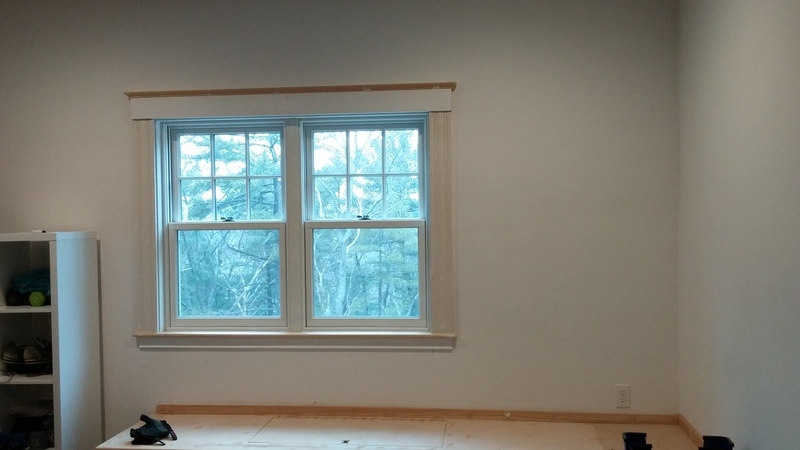 Each window required seven steps: remove storm windows and clean, scrape and sand, first coat frame, first coat sashes, second coat frame, second coat sashes, replace storm windows. For each step I had to move the ladder. When I painted the windows, the ladder had to be lowered halfway through the coat to get easier access to the lower half of the window. So, remember when you get a price to paint your house, size is only one factor in determining the amount of time it will take, and thus the price that will be charged. It has been a very cold and wet Spring in Northeast Massachusetts, which has put a lot of exterior paint jobs on hold. Which brings me to a brief blog on ensuring that you read the back of the paint label. Whether you are planning a DIY job, or you are hiring a professional you need to know that there are limitation to what can been done in less than perfect weather conditions. All paints and stains have a range at which a paint should be applied, which is usually between 50-90 degrees, and they all have a time a drying time, which can range anywhere from one to twenty-four hours. It is very important that you adhere to the temperature range, and it is not just that air temperature that is important, it is also the surface temp. If the air temp is hovering around either of the extremes of the temps it is best not to paint. However, if you have a infrared thermometer, or a willing to purchase one you can easily find out the surface temperature before painting. Just point and shoot, to get the temperature. Moisture can cause two problems. First if the air has a lot of moisture in it the paint will take longer to dry, which in turn means that you will have to wait longer to apply a second coat of paint. Second, if the surface is wet you cannot paint. And it is not as easy as looking or feeling the wood. There are specially designed moisture meters that have prongs that are pushed into the surface to determine if there is to much moisture. If the wood, or or another type of surface, has too much moisture in it, the paint or stain will not adhere properly. 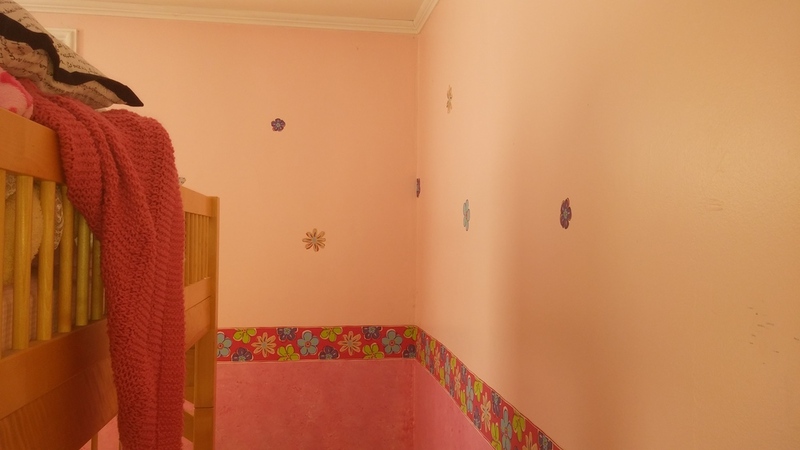 I am not going to try to tell you that removing wall paper and then applying paint it a easy job. The pictures form the job below, which included a small bathroom that did not have wallpaper on it, took over a week to finish. First, you must remove the old wallpaper. If sizing was used, which is the proper way to put wallpaper up, then it should be a fairly easy, but time consuming, process. If sizing was not used, it becomes much more time consuming and the wall will get much more damaged. Second, if there still a lot of paste on the walls you should sand them to smooth it out. Then you have to either use Gardz or an oil primer to seal the remaining paste on the wall. I used Gardz. If you do not do this, the waterborne paint that you put on the wall will reactive the paste, and the paint will not go on properly. Third, you need to make repairs to the wall. Fill the holes and skim coat the damages caused when you removed the wallpaper. Forth, you need to prime all of the repairs. If you make a lot of repairs it might be easiest to just prime the entire surface. This ensure that you will not miss any of the repairs which will cause flashing when you apply the finish coat. Fifth, you finally get to paint the walls the color that you have been dreaming of all of those years that you looked at the aging wall paper. Take a look at the pictures below. The are organized from start to finish. The bathroom did not have wallpaper on its walls. the room is obviously not completed. The home owner is going to have new doors put on the bathroom and closet, and crown molding and baseboards will be installed. This made cutting the ceiling much easier. I am often explaining why paint and primer in one paints are not necessary and really not a good idea to home owners. Most home owners, when they paint, are repainting a room. When you are repainting a room, you will usually not need a primer. Primer will usually only be needed when unpainted surfaces such as wood or plaster are being painted, a latex paint is being put on top of a oil paint, a previously stained wood will be painted, or a clear coating, such as polyurethane will be painted. Sometimes it is also recommended that a tinted primer be used when a dark color is being repainted with a light color. This is done to save money as primer is cheaper than paint ( I am using the term "paint" to refer to paint that is not primer). So, the question is "why use a paint and primer in one." The answer is you don't need it. If you read the back of some of the more popular paint and primers in one that are sold by the box stores you will notice that you will be instructed to use the paint to "spot prime." This is when you prime repairs in the walls that you might have repaired with joint compound, or raw wood in the trim that was exposed when the paint job was damaged. Then once you have spot primed with the paint and primer in one, you should paint the entire area. In other words, the paint and primers in one are not magic. There is not a paint and a primer in the can that magically separates and creates two layers of paint when it is applied to the wall and thus eliminating the need to prime. Therefore it is much better to purchase a primer, and use it to spot prime, and then use a paint to paint the walls. Primers are better to prime with than the "magical" paint and primers in one because primers are formulated differently than paints. They have more binders in them, which allows for better adhesion to the raw material. They often are formulated to hide stains and tannins (those colors that bleed through the paint from the wood) better. I have had a couple experiences dealing with paint and primers in one. A home owner supplied some paint and primer ceiling paint to me for a job that I did. They had the seams on the blue board redone. So, I was painting raw joint compound. I called the 1-800 number on the can to determine if I would need a primer to seal the joint compound before I painted. Joint compound is porous, and if it is not sealed with a primer, the paint will be absorbed by the joint compound, which will result in what is called flashing. The area will appear more dull then the paint surrounding it. I was told be the representative that I would have to use a separate primer. One another repaint, I ran into the problem of paint bubbling when I put on the new paint. Although I was not able with complete certainty to determine that the paint was a paint and primer in one (it might have been just a paint), but the paint that same off was the same color on both sides and painted on raw plaster. If a primer had been used, the underside of the paint should have been white. The best way to fix this this is too take off all of the paint. However, most home owners don't want this done. So, I fix it as best as possible and explain to the home owner that they may have problems in the future. And, it does not matter if the paint in primer in one is from one of the box stores or is manufactured by one of the higher end paint companies. If you asked an employee of a paint store with knowledgeable employees (99% of the employees at box stores know how to do little more than mix paint) they will tell you that you will need a primer if you are painting over raw plaster or covering up the ugly paneling in your living room. In fact, I have been told my many that many of the paint companies are doing nothing more than changing the label on their paints. In many ways this upsets me. Now I have to explain to home owners even if the better companies are doing it, the paint and primer in in one is a myth--that they are only doing it to compete with the box stores. If you are a professional painter. 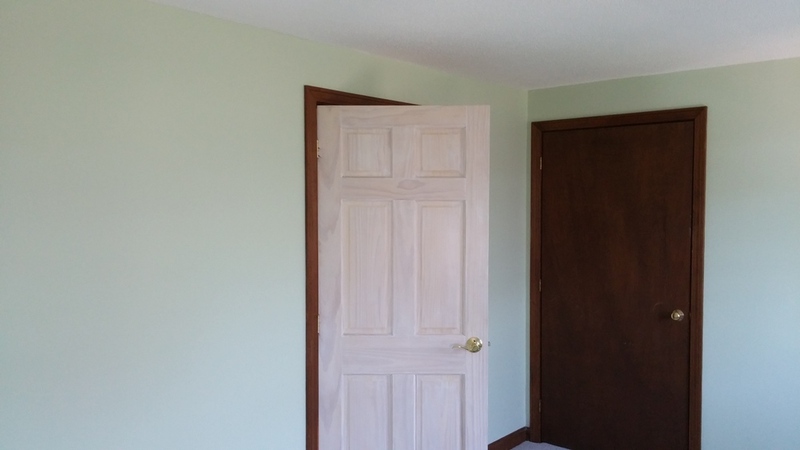 it is pretty easy to tell the difference between a good paint and a lower quality paint. Quality pants are just easier to work with than lower quality paints. They are easier to cut with, they cover better, they go on smoother, and they just look better when they dry. However, It is not always easy to convince home owners that going with the higher priced paint is worth the cost. Some think that "paint is paint," and there really is no difference between a $25 and a $50 can of paint. 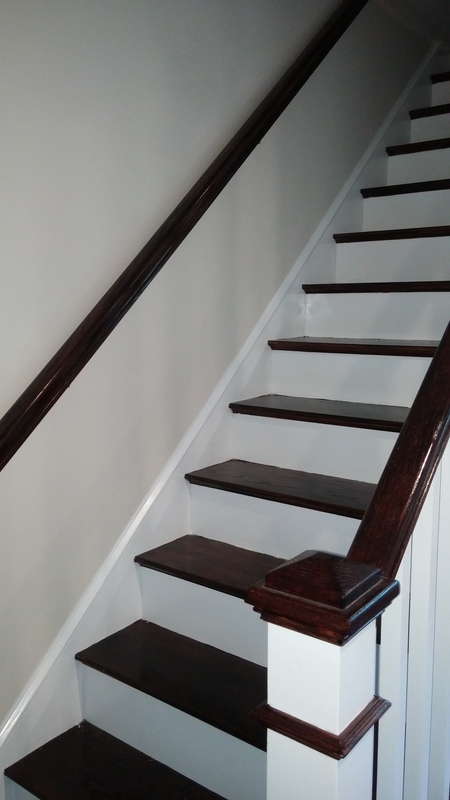 From my point of view, and that of most professional painters, I often find it hard to understand why a home owner would spend their hard earned money to pay a professional painter and then use a sub-par paint. This is especially true when a home owner is only painting one or two rooms. The price difference between a good paint and a inferior paint need for an average sized room is almost negligible. And, I do understand the perspective of the home owner. A wall painted with a inferior paint looks just as good as a wall painted with a quality paint, The big difference for the home owner is that the wall painted with the quality painter will look better than wall painted with the low-quality paint much longer. And, if there needs to be touch ups, they will look better (sometimes almost not even noticeable) if a quality paint is used. Ever wonder why some paints look much smoother than other paints when they dry? It is called leveling. There are many factors to getting a level surface. But first and foremost you need a paint the levels well. There are many paints that have been designed to do this specifically such as Benjamin Moore's Advance and California;'s Nextech and Ultraplate. These paints have been designed to give an ultra smooth finish on trim and cabinets. However, it is not as simple as putting on a coat of one of these products to get the smooth finish. The best way to get a smooth finish is to spray the paint. However, most non profession (and many professionals including myself) do not own a sprayer. But, if you willing to put in the work, you can get a finish that shows almost no brush marks at all. In order to get the almost ultra smooth finish without using a sprayer you will have to put some work in. First, if you much clean the area to be painted thoroughly. Next sand, sand, sand. If has been previously painted I suggest starting with a rough sand paper such as an 80 grit and then moving to a 220 grit. If it has not been painted previously you will have to use at least one coat of primer and then sand with a fine sand paper before putting on the finish coat. Vacuum well and then right before you paint use a tack cloth to remove any left over dust. The pint of all of this prep work is that if the underlying coasts are not smooth or there is dust is will keep the finish coat from being as smooth as possible. Also the dust will keep the finish coat from adhering. Sometimes you just need a fresh coat of paint, and not a new color. If you love the colors in a room, but the room just looks dingy no matter how much cleaning you do, and there are dings in the trim, and a bunch of holes where pictures used to hang, you might just want to consider putting a fresh coat of the same color on the walls and trim. 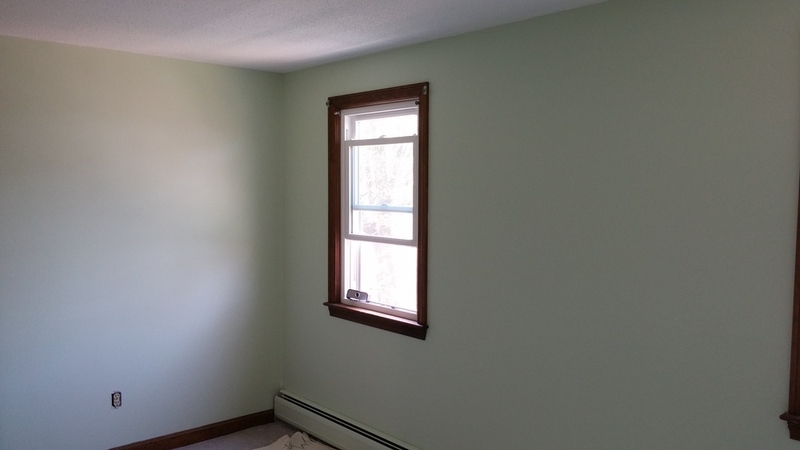 I recently did a repaint of a great room in the original color on the walls, and put a white on the trim that was a bit brighter than the original color. Even though the walls were the same color the fresh coat (along with repairing all of the holes and other imperfections) made a huge difference. I also did the hallways and entrance, which were changed to a light grey. The colors used were C2's Architectural White on all of the trim (however it was mixed using Benjamin Moore's Advance Satin) C2's Linger in LOVO eggshell, and American White on the walls in the hallways and stairwell in Benjamin Moore's Regal Select eggshell.